Winner by Knockout Justin Bondar, 1:13 1st Round. Phillip Arredondo has been issued a 30 day no training and 45 day no competition medical suspension until June 5th, 2014. Winner by Split Decision Amanda De Rosa. (**) Aileen Maquiraya AND Amanda De Rosa have been issued a 7 day no training/no competition medical suspension until April 27th, 2014. 4-23-14: This bout decision is under review by IKF California. 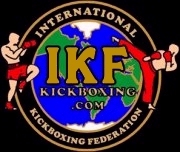 The Event Judges were appointed by the California State Athletic Commission and not IKF. Winner by Unanimous Decision Robert Lemus. Winner by Split Decision Emily Griffen. (**) Vanessa Gonzalez Leon AND Emily Griffen have been issued a 7 day no training/no competition medical suspension until April 27th, 2014. Winner by Unanimous Decision Ariana Gomez. Winner by TKO Roman Gudino-Dumas at 1:44 of Round 3. John Garcia has been issued a 30 day no training and 45 day no competition medical suspension until June 5th, 2014. Winner by Unanimous Decision Marie Choi. Winner by Unanimous Decision Paul Silva. Paul Silva has been issued a 180 day no training/no competition medical suspension until October 20th, 2014. MUST BE CLEARED BY DOCTOR TO COMPETE AGAIN: Possible (L) Broken Hand. Judge Luis Cobian 40-36 Spenser Mix. (**) Spencer Mix has been issued a 7 day no training/no competition medical suspension until April 27th, 2014. (**) Julian (Jules) Wallace has been issued a 60 day no training/no competition medical suspension until June 19th, 2014. OR CLEARED BY DOCTOR TO COMPETE AGAIN PRIOR TO JUNE 19th, 2014.